News >> Spice mills at MyGoodKnife! We continue to expand our range. Now at Mygoodknife store you can buy not only knives, but also various kitchen accessories. So, now there are salt, pepper and spice mills of the german manufacturer AdHoc. 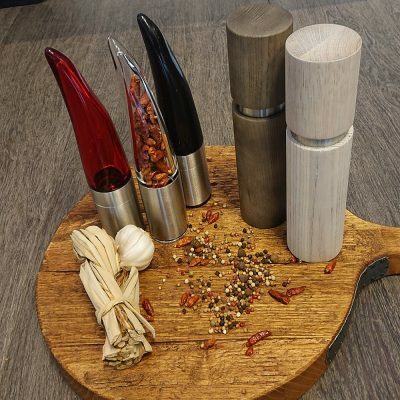 AdHoc makes best salt-, pepper- and spice mills. Owner Frank Kaltenbach and the AdHoc team have been developing, designing and producing according to this principle since the founding of the company in 1995. Inspired by the classic design principle “design follows function” products with a good deal “more” are created for kitchen and dining culture: more solid functionality, more beauty, more quality – more value. Because AdHoc products are thought through down to the smallest detail, fascinate with their straightforward elegance and are simply a pleasure. AdHoc’s pretension is to develop innovative lifestyle products for kitchen and table top which combine highest standards in function, aesthetics and quality. AdHoc spice mills you can buy HERE.